At least 44 people – including 37 demonstrators and six police officers – have been killed in protests over Congolese President Joseph Kabila‘s perceived bid to extend his rule, Human Rights Watch (HRW) stated. The unrest in the Democratic Republic of Congo started on Monday after its election commission decided to try to postpone the next presidential vote, due in November. Kabila’s opponents say the proposed delay is a manoeuvre to keep him in power although ruling party politicians deny this. Kabila is barred constitutionally from running for a third term and his allies say he will respect the constitution. With the disturbances forcing schools to close and halting public transport in the sprawling riverside capital Kinshasa, the United Nations expressed fears the situation could worsen. The United States said Kabila’s government should have taken steps to defuse the violence and that it was prepared to impose sanctions targeting individuals involved in abuses. French President Francoise Hollande blamed Congo authorities and urged them to respect the constitution and hold elections this year. Adding to the mix of disapproval, Congo’s influential Roman Catholic Church suspended its participation in talks over the timetable for the next elections and stressed that Kabila should not be a candidate when they are held. Several people were killed overnight when security forces burned down the headquarters of the main opposition party, the Union for Democracy and Social Progress (UDPS), and attacked buildings of other opposition parties, according to Ida Sawyer, an Africa researcher for New York-based HRW. Twenty people were killed in clashes on Monday and another 17 on Tuesday – “most (of them) when security forces fired on crowds of protesters”, Sawyer said. Interior ministry spokesman Claude Pero Luwara said the death toll stood at 17 and that Human Rights Watch’s statement was a “typical” exaggeration by the group. The ministry had earlier said three of those killed were policemen. The early hours fire was a criminal act, said opposition leader Felix Tshisekedi, a UDPS official and son of veteran opposition figure Etienne Tshisekedi, who lost to Kabila in a 2011 presidential run-off. “We have on our hands seven dead and two people who were amputated: one at the arm and another at the leg, in the fire at our headquarters in Limete. There are also multiple people wounded at the hospital,” Felix Tshisekedi told Reuters. Government spokesman Lambert Mende condemned the attack on the UDPS premises but denied that security forces were involved. 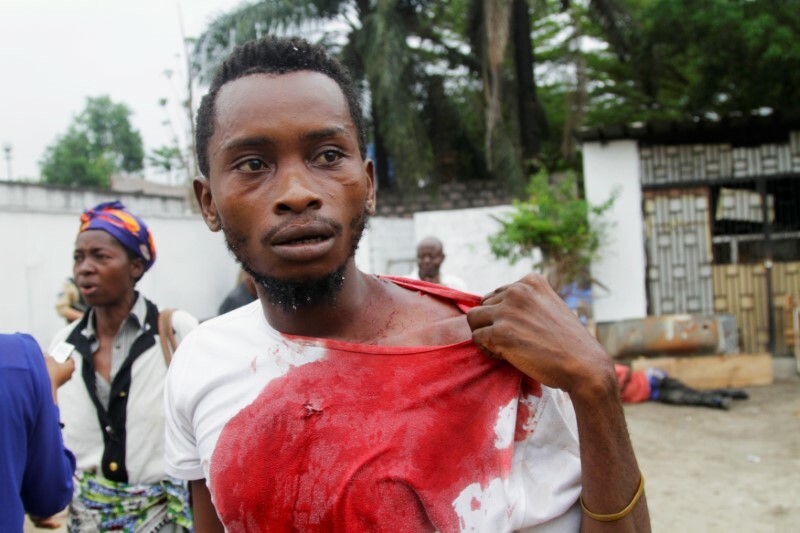 Witnesses said calm returned to central Kinshasa by Tuesday afternoon, though there were reports of clashes in the suburbs. 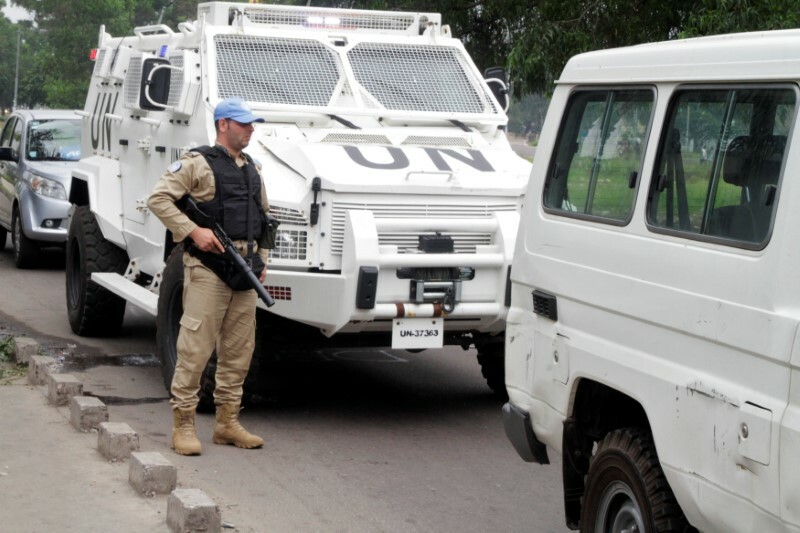 Nearly 200 people were believed to have been arrested by Congo authorities on Monday and the United Nations received reports of excessive use of force by security forces, U.N. human rights spokesman Rupert Colville told reporters in Geneva. Kabila took power in 2001 when his father was assassinated, but must by law step down in December. His opponents fear he may follow the example of leaders in other African countries such as Burundi, Congo Republic and Rwanda and change the constitution to extend his rule. Congo has not experienced a peaceful transition of political power since its independence from Belgium in 1960. Tom Perriello, U.S. Special Envoy for Africa’s Great Lakes region, said Washington would hold all sides accountable for their actions during the latest violence, which prompted Washington to suspend all travel by its officials to Congo. “Unfortunately, the pattern over the last year has been to dramatically reduce that open political space … We have seen a crackdown on the rights and freedoms of Congolese people,” he told a news conference in New York.